Climate change is no longer a thing of the future; it is affecting Vermont today. The Vermont Climate Assessment (VCA) presents information to help prepare for the impacts and opportunities from Vermont’s fast-changing climate—while noting the potential costs of inaction. Dr. Gillian Galford, a climate scientist and professor at the Gund Institute for Ecological Economics within the Rubenstein School for Environment and Natural Resources, University of Vermont, is the lead author. Each chapter had one or two graduate students as writers, including: Sam Carlson, Sarah Ford, Ann Hoogenboom, Julie Nash, Elizabeth Palchak, Sarah Pears, Kristen Underwood and Daniel Baker. Bryne Hadnott, UVM research specialist, contributed to analysis of Vermont’s climate data. Dr. Alan Betts, from Atmospheric Research, contributed to climate data analysis and writing of the full report. Additional authors are noted in individual chapters. What are the Assessment’s data and methods? 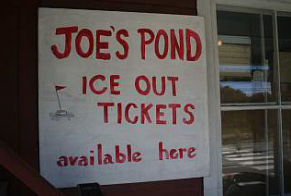 The authors collected and analyzed data from over 175 scientific studies, interviews with local and state government officials, academics NGOs, businesses, and farmersand observational data from formal sources such as the National Weather Service and from citizen scientists, such as the Joe’s Pond Association Ice-Out observations. Historical climate data was supplied by NOAA and the National Weather Service with expert input from Andy Nash, Meterologist-in-Charge at the Burlington office of the National Weather Service. Projections of future climate change are supplied by the Intergovernmental Panel on Climate Change and refer to computer models from the Couple Model Intercomparison Project Phase 5 (CMIP5). These models represent a range of scenarios from low to high global greenhouse gas emissions and other aspects of atmospheric and global change. Historical changes in our climate, such as those recorded in NOAA/NWS data sets, project the trends expected over the coming decades. Global modeling, such as CMIP5, gives us an indication of general changes in Vermont’s climate (warmer, wetter) without specifics on how this will play out within different regions. Combining the general projections from global models (large-scale average changes in climate) with historical trends (spatially explicit measurements of climate) allows us to project regional changes. For example, global models tell us annual precipitation will continue to and the historical climate trends across Vermont show that the largest increases are occurring in mountainous areas. At this time, we can infer much about climate change in Vermont; future research is needed for detailed downscaling of global models to Vermont’s terrain to provide further detail on projected climate. All lead authors consulted, co-authored, or were reviewed with/by external experts in the subject matter. Direct references to the data and literature sources can be found in the full report. Each chapter of the VCA concludes with confidence ratings around the impacts of climate change on Vermont for their respective sector; these range from “Very High” to “High,” “Medium,” and “Low.” “Very High” confidence rankings are based on strong evidence: established theory, multiple sources, consistent results, and well-document methods. At the other end of this scale, “Low” confidence findings have inconclusive evidence with limited sources, extrapolations, inconsistent findings, poor documentation and/or methods that are not tested, and a disagreement or lack of opinions among experts. The majority of findings in the VCA have a “Very High” to “High” confidence level. How is the Vermont Climate Assessment connected to the National Climate Assessment? The VCA is partnered with the National Climate Assessment (NCA). The VCA is the first state-level climate assessment modeled after the NCA. The NCA is mandated by the US Global Change Research Act of 1990 and now serves as a broad communication tool on climate change and its impacts around the United States. The third National Climate Assessment (NCA) was officially released on May 6, 2014. The VCA mirrors the NCA structure but is tailored to the sectors most applicable to Vermont environmentally, socially and economically. Why Isn’t the National Climate Assessment sufficient for planning in Vermont? While the NCA contains a wealth of information it provides only high-level summaries. The Northeast regional report does not address the breadth and depth of impacts on economic, social and environmental impacts specific to Vermont. The VCA complements the NCA, providing detailed analysis of economic and other impacts on specific regions of the state and sectors of the Vermont economy that may be challenged or aided by future climate change.